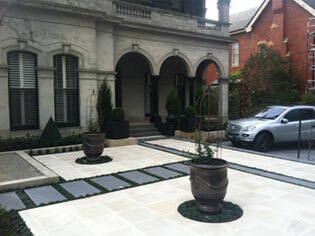 Kinkora is a period renovation with a modern twist from KHD Landscape Solutions. Located in Melbourne, Kinkora combines the old with the new. Period homes have a special place in our hearts and KHD Landscape Engineering Solutions are proud to partner with industry professionals involved in this work. This project, Kinkora in Melbourne, is a great example of a high quality period renovation that combines the old with the new. Kinkora is a stately home where many original period features were kept during the renovation process to ensure that at the end of the project, the house still looked like a period home. 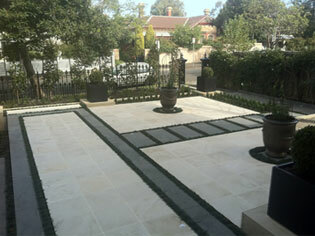 The garden features traditional Bluestone and ivory Sandstone which provide a high class finish on the outside hard surfaces. 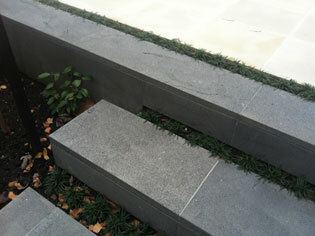 The design is a simple yet highly effective and practical example of natural elements working together. The garden design also provides for a Bluestone driveway which not only provides access for the owners and space to park cars, it’s also home to a 20,000 underground water tank supplied by KHD, which was installed during construction. Underground tanks are common in commercial projects, and are becoming popular for inner city areas where space is at a premium. 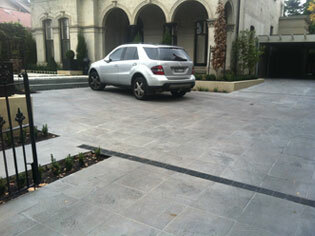 They are ideal for driveway areas. Kinkora is a great example of a period renovation that keeps much of the old with a mix of the new.